In km, we see two people. Idependently of their relationship. They could be a couple maybe. Or not. He has just revealed something to her. We don’t know what the revelation is about. They are both awkward. They are in difficulty. The suffo- cate. The air starts getting scarce. They bleed. They try to move. This is a film about the kil- ometers which you will run later in love. The breaking out of a relationship. Breaking bonds with the past. Leaving behind what keeps you bound in your seat. Paralised. Immobile. The attempt to be alive. This is a game of pain. What brings more pain? The internal or the external traumas? This is a game of suffoca- tion. Who will manage at last to breath the last air that remains? This is a film about being entraped. In a human relationship. How diffi- cult is it to open the door and get out of it. What keeps you in your place? At the end we see the two heroes. 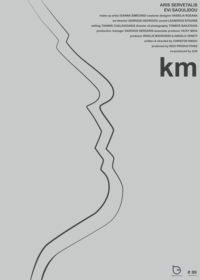 A few kilometers be- fore. No traumas. How different are they? Did this scene happen before? Or is in a care in a constant course? One next to the other. No change. They will just be driving. Our at- tempt was to show the suffucation of the two characters and to put the viewers in the car through the shots and the atmosphere of the film. We tried to keep the film as simple and lean as possible.”km” is an award winning sort film written and directed by Christos Nikou. 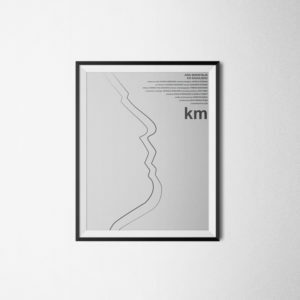 The poster designed for the film represents the minimalistic criteria of the director and has won the first prize “Young Designers Contest” of gr design magazine on the poster category.Learn more about the film here and here.